Heavily sea-rolled and worn worked flint tool, covered in chalk patination (see third image). The flint measures 80 mm long, 60 mm wide and 30 mm thick, and unfortunately about 20% of the working end has recently broken off. Due to wear and damage on this hand-worked tool it has been difficult to confidently identify. Bryan Popple of Bournemouth Natural Science Society and Museum believes it could possibly be Homo neanderthalensis dating to around 200,000 years bp (before present). The smaller size indicates typical Neanderthal workings in comparison to the larger and older Homo heidelbergensis handaxe previously reported as MAS-100062. The attached images shows both handaxes for comparison. The possible Neanderthal tool is the smaller darker tool. 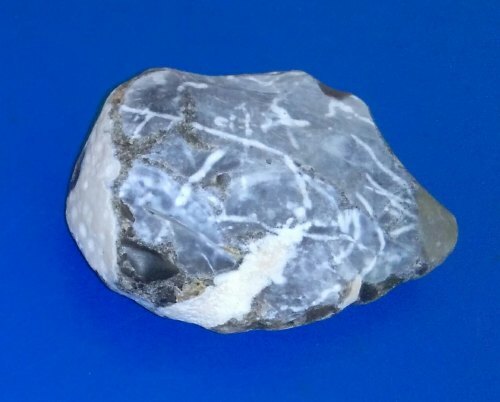 Matt Leivers, an in-house flint specialist at Wessex Archaeology was unsure whether the flint was a handaxe and would need to visually inspect the object in order to be certain. This item was found with a large handaxe (MAS-O100062).